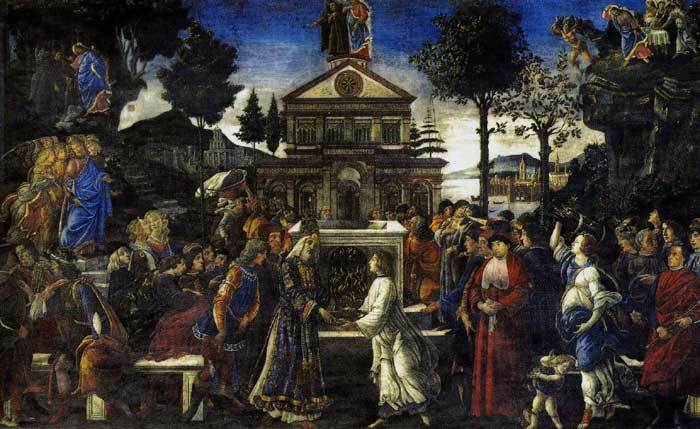 In 1481 Botticelli was summoned to Rome. 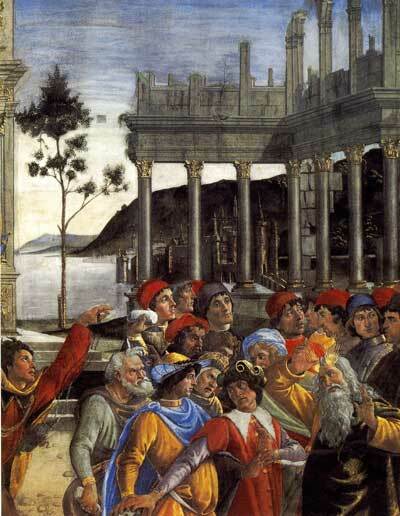 He and several other artists had been selected by Pope Sixtus IV to decorate the walls of the Sistine Chapel. 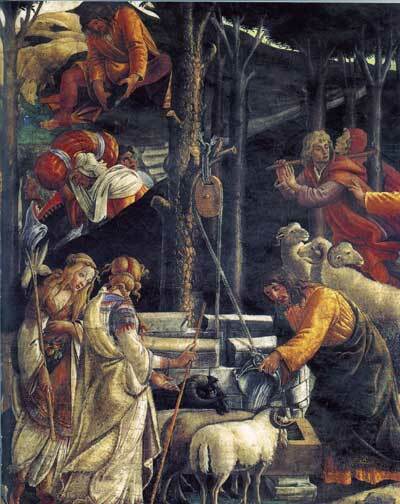 These artists included Ghirlandaio and Rosselli from Florence and Perugino from Umbria. This was some twenty-seven years before Michelangelo began his work on the ceiling. The frescoes were completed in a relatively short period of time, about eleven months. 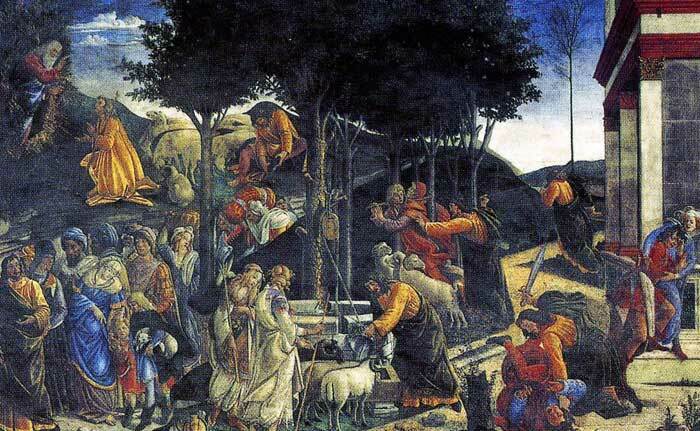 The artists submitted a sample fresco for approval by papal officials and Botticelli's contribution was three paintings, "Events of the life of Moses", "The Temptation of Christ", and "The Punishment of Korah". 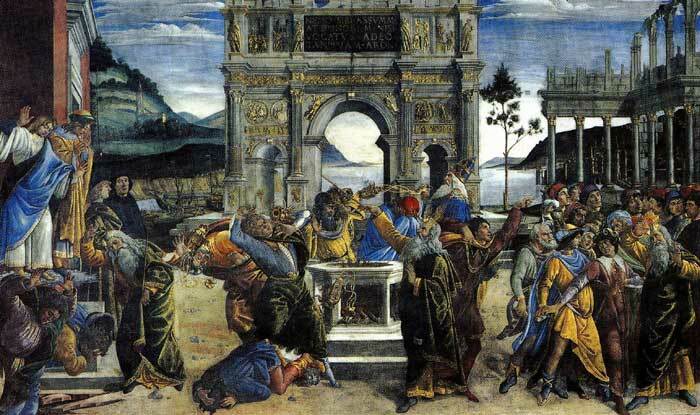 Botticelli has portrayed several scenes from the life of Moses, cleverly showing different points in time in the young prophets life. The figures are arranged in diagonal groups that lead the eye into the picture. Moses appears twice in this detail, he is seen watering the sheep of Jethro's daughters, and taking off his sandals at the top of the detail. The Devil tempts Christ in three ways in this fresco. He attempts to persuade Christ to cast himself down from the temple, shown in the top centre of the picture. In the top corners, he shows Christ the world's riches and challenges the Son of God to turn stones into bread. The Jewish celebration in the foreground depicts a priest receiving offerings of a sacrificial bowl, animals, and wood. The painting depicts three episodes and tells of a rebellion by the Hebrews against Moses and Aaron. On the right, the rebels attempt to stone Moses after becoming disenchanted by their trails on their emigration from Egypt. Joshua has placed himself between the rebels and Moses protecting him from the stoning. The centre scene shows the rebellion led by Korah and on the left the rebels group together waiting to receive God's punishment. The message is clear, no one should doubt the authority of the Pope over the Church. The power of the papacy was constantly being questioned at the time. This painting serves as a reminder that the Pope's leadership was granted by God when he gave Peter the keys to the kingdom of heaven.